Visualization of mass transfer is a powerful tool to improve understanding of local phenomenon. The use of an oxygen-sensitive dye (colorimetric technique) (Dietrich et al., Chem Eng Sci. 2013; 100:172–182) has showed its relevancy for locally visualizing and characterizing gas–liquid mass transfer at different scales (Kherbeche et al., Chem Eng Sci. 2013; 100: 515–528; Yang et al., Chem Eng Sci. 2016; 143:364–368). At present, the occurrence of a possible enhancement of the gas–liquid mass transfer by this reaction has not been yet demonstrated. 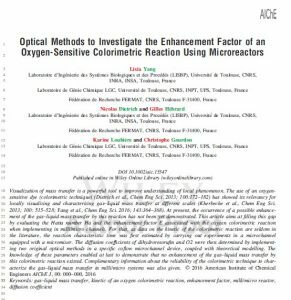 This article aims at filling this gap by evaluating the Hatta number Ha and the enhancement factor E associated with the oxygen colorimetric reaction when implementing in milli/micro channels. For that, as data on the kinetic of the colorimetric reaction are seldom in the literature, the reaction characteristic time was first estimated by carrying out experiments in a microchannel equipped with a micromixer. 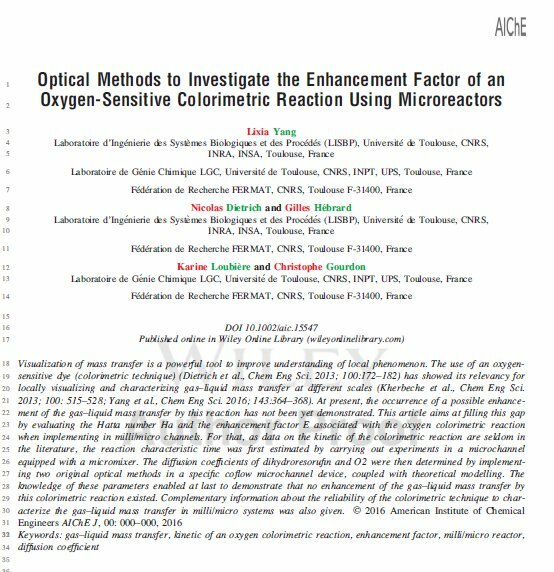 The diffusion coefficients of dihydroresorufin and O2 were then determined by implementing two original optical methods in a specific coflow microchannel device, coupled with theoretical modelling. The knowledge of these parameters enabled at last to demonstrate that no enhancement of the gas–liquid mass transfer by this colorimetric reaction existed. Complementary information about the reliability of the colorimetric technique to characterize the gas–liquid mass transfer in milli/micro systems was also given.